What do you think about knee length wedding dresses? When we talk about marriage or wedding, a beautiful bride with big and long bridal gown might pass through our mind first. Yes, most brides prefer to wear long one such as ballgown, mermaid, or trumpet. 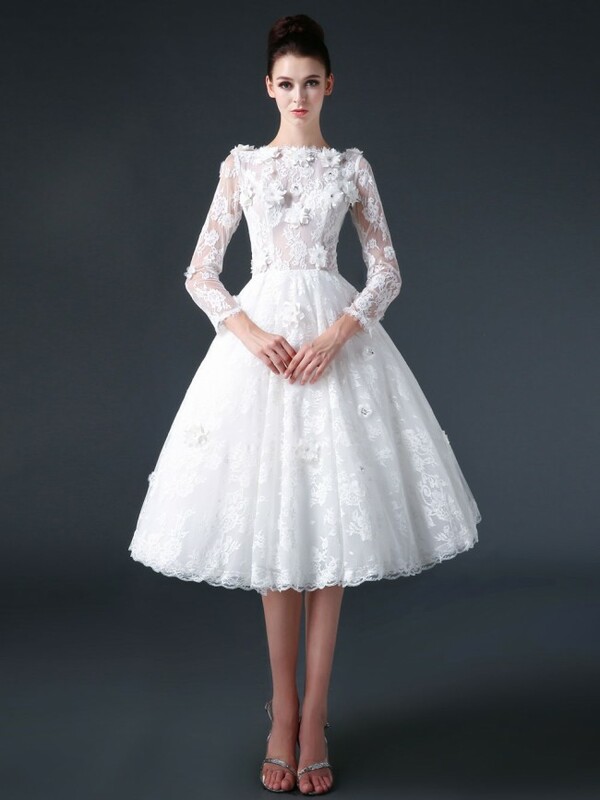 It is true that that kind of wedding gown is so amazing, but why not trying the one with knee length? It may be look simple, but it is still capable of bringing our beauty out in its own way. What’s more exciting about it is that its design is varied. 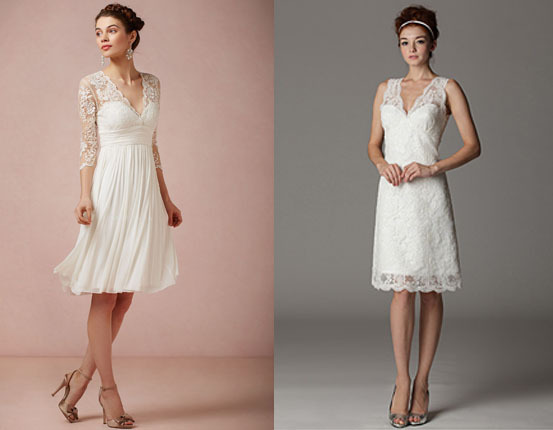 You can find a few of knee length wedding dresses below. So, check them out, soon-to-be-bride ladies. Knee length dress will look so lovely if it is completed with sleeves. We can choose how long the sleeves we want to have. It could be long, elbow or short. Personally, we prefer the one with elbow sleeves because of its elegance. Moreover, the best fabric for them is none other than lace. Lace sleeves mixed with chiffon for the main dress will be a perfect combination. The chiffon part will let us to move smoothly, especially when we are dancing. Can you imagine how the bottom will flow beautifully just like wind? Yup, that will amaze other guests. It looks much sexier than the second one, knee length dress with layers. Our next design is a dress with layers. Layers here refer to a number of fabrics are stacked in a certain design. Usually, the layers are applied on the bottom part of the gown. It aims to give more volumes to it. We will obtain a curvy shape by wearing this one. The layers could be made of several kinds of material such as ruffled or tutu. Both are great, but we love ruffled layers even more. Think of an A-line strapless gown with black ribbon on the waist as a belt feature. That is certainly magnificent to wear, right? The final dress can be said to be unique and different. It is because the dress is completed with a cape. Nope, we are not talking about superhero cape. This one is designed specially for wedding gown. Its apperance will make any brides to be so romantically divine. Since this is a knee length dress, we do not recommend to wear a cape with length to be near our feet or even more than that. In this part, it is better to have one with only waist length or a bit above it. The best fabric for the cape is certainly lace with such tremendous pattern. It will even be better if it has a hoodie. This hoodie will replace wedding veil which we have seen commonly. This combination surely brings a sweet fantasy to our wedding. Well, that’s all, ladies. These are only three designs, but there are some more of them you can find out there. Try to search it through bridal magazines, wedding shops, or the Internet. If you cannot find what you really like, asking some opinions to an expert is recommended. The expert will give you some examples of knee length wedding dresses which might satisfy you. 0 Response to "Beautiful Brides in Knee Length Wedding Dresses"